Nutrition is an important component of an athlete’s overall performance, before, during and after competition. By using nutrients the body absorbs through food consumption, we are able to obtain energy. Mitochondria are the ‘furnaces’, responsible for producing this energy. They are the powerhouses located within cells and convert glucose (a sugar molecule derived from carbohydrates) to adenosine triphosphate (ATP). Often called the “molecular unit of currency” of intracellular energy transfer*, ATP is a coenzyme that enables our cells to perform a spectrum of functions, and is the main source of energy that allows the body to generate movement. ATP and athletic performance, then, are closely related. ATP provides energy your body needs for muscle contractions, blood circulation and cardiac function, and generally fuels the body for whatever function it may be performing. The harder, longer, and more intense the workout, the more ATP that is used. When an athlete repeatedly dips into their ATP source day after day, week after week, there must be replenishment or else they begin to run that energy source dry. 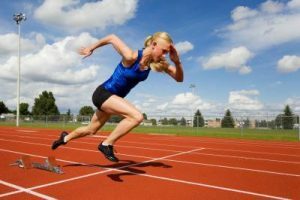 This can obviously cause a loss in athletic performance – the athlete would not be able to operate at prime capacity if the ‘engine’ doesn’t have fuel. The human body produces ATP through the consumption of food eaten daily. However, there are many internal and external factors that may hinder the amount of nutrients we are able to absorb and assimilate. This may include foods treated with pesticides and other harmful substances, medications, metabolic stress, gut flora issues, and other factors that don’t provide optimal conditions for the body to produce ATP. It is particularly important for athletes whose metabolic processes must perform at an optimal level day in and day out, that their diet include easily absorbed (natural) vitamins, minerals, trace nutrients, and high quality proteins. The ideal is to have a natural source of highly active nutrients in a form that is easily absorbed by the body and this is where cascade fermentation holds the key to success – natural foods are broken down into highly bio-available liquid nutrients and building blocks. Incorporating a supplement such as Regulat® helps increase ATP and athletic performance – in a study where participants used the product twice a day for three months, they showed an increase in ATP of more than 180% compared to baseline. The more quality building blocks are available, the more training will influence the formation of new mitochondria. For more information, please view the sources below. *Knowles, J. R. (1980). “Enzyme-catalyzed phosphoryl transfer reactions”. Annu. Rev. Biochem. **“Are you already on ATP, or are you still training?” TriTime Magazine. This entry was posted in Energy and ATP, Fermentation and tagged athletes, athletic performance, athletic recovery, ATP, fermented foods, mitochondria on October 7, 2016 by Ashley. Have you been wondering why having a glass of lemon water first thing in the morning is all the rage these days? The lemon is a powerful yellow ball packed full of Vitamin C that aids in digestion, detoxification, mood balance and energy. It’s also full of other important nutrients, such as potassium, magnesium, and copper. 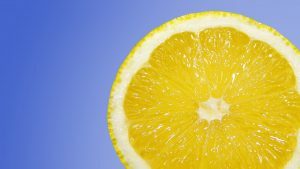 While lemons were first used solely as decorative plants, others finally discovered their healing power in the mid 1700s as they began migrating into Europe. During this time of exploration, lemon was soon recognized for their ability to heal scurvy, a common disease amongst sailors during this time. Although lemons are rarely consumed on their own due to their intense sour flavor, they are used in conjunction with many sweet and sour food and beverages for added taste. Keep them stored at room temperature and away from direct sunlight so as to avoid rot. Because lemons are so high in Vitamin C, they are an incredible source for digestion. It’s also an ideal way to start your day with a big dose of Vitamin C without having to consume something like a glass of sugary juice. Vitamin C is also said to strengthen the immune system to fight against illness such as the flu or the common cold. It’s antioxidant value is also said to combat against the formulation of free radicals that may cause cancer. This entry was posted in Ingredients on July 8, 2016 by Ashley. Two ingredients you’ll find in our Regulat formula – amongst 20 other whole ingredients of fruits, vegetables, and nuts – include artichokes and figs. Artichokes and figs are both recognized for their superfood nutritional qualities. While artichokes in their whole form present a bit of a challenge to work with, they are worth the effort! 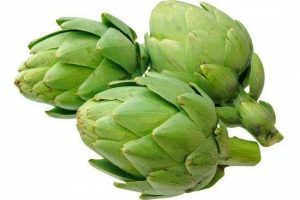 Most often people choose to consume the heart of the artichoke, however the leaves actually have the most nutritional value. The globe artichoke is part of the thistle plant, and it is one of the oldest vegetables known to mankind. It’s believed the artichokes originated from the Mediterranean region, although now California supplies nearly 100% of the U.S. artichoke supply. Artichokes are packed with phytonutrients (i.e. a substance found in certain plants which is believed to be beneficial to human health and help prevent various diseases) such as quercetin, rutin, gallic acid, and cynarin, all working to protect against many health risks including cancer, heart disease, liver dysfunction, high cholesterol, and diabetes*. They are also packed with antioxidants; in 2004 they were identified as a top contender in a vastly comprehensive study on antioxidant value in commonly consumed foods (conducted by the United States Department of Agriculture). Figs are seasonal fruits originating from parts of Asia, however they are available year-round in dried form. They have a unique texture containing a soft, juicy center that is packed with seeds. They are a delicious fruit packed with minerals, vitamins and fiber, figs grow on small trees and are members of the mulberry family. Figs contain nutrients such as including vitamin A, vitamin B1, vitamin B2, calcium, iron, phosphorus, manganese, sodium, potassium, and chlorine. Their high amount of fiber (5g of fiber for every three figs consumed!) aids in weight loss as it contributes to improved bowel movements and promotes longer lasting feeling of fullness. 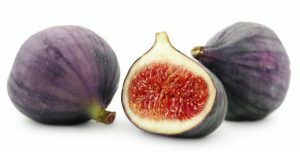 Figs also contain a high amount of calcium, which aids in bone density. This entry was posted in Ingredients on June 3, 2016 by Ashley. For thousands of years people around the world have found that fermenting certain foods in a controlled way increases digestibility of the raw food and adds health-giving effects. Evidence of the use of controlled fermentation dates back to ancient China, South America, and ancient Egypt, and includes leavened breads, milk products and pickles. 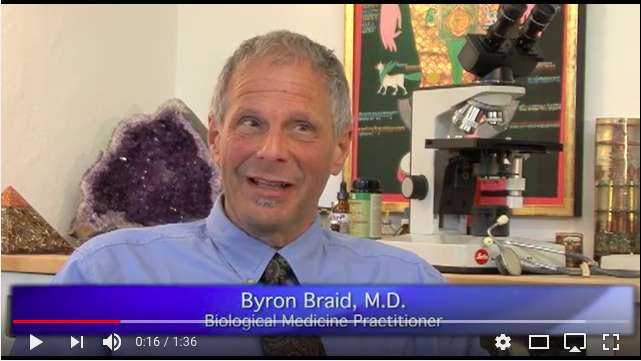 “One of the earliest functional attributes of fermented foods was their ability to introduce a change in the microflora of the human digestive tract”, says Mark J Tallon, PhD, Founder of NutriSciences Ltd. “Because many fermented micro-organisms, such as probiotics, survive digestion, they can reach specific sites of benefit within the intestinal tract where they perform functions that may aid in host health,” adds Tallon. Tallon recognizes the history of fermentation and that it has evolved into a natural, yet state-of the-art science that is an invaluable component of the human diet. Since the time Louis Pasteur proposed using microbial metabolism to produce fermented foods, “microbiologists have uncovered the interactions of bacteria and yeast as a means of producing many natural products,” says Tallon. As important benefit of fermentation is that of increasing the effective nutritive value of foods by increasing the ability of the body to absorb vitamins and nutrients presented during digestion. 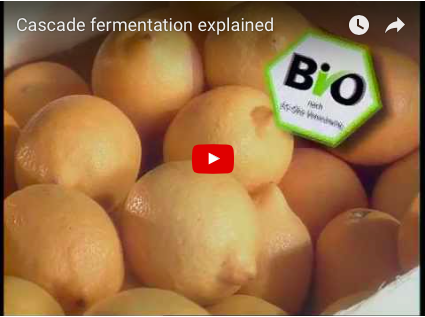 Fermentation methods have evolved from traditional to modern techniques that allow for greater production of fermented products in a clean, controlled environment. A modern contribution to the fermentation tradition is cascade fermentation, a methodology modeled on the human body’s natural digestion process. The cascade ensures that enzymes, as well as all other micronutrients with a large molecular weight, are broken down into smaller units. It is well known that only small molecules can be absorbed through the intestinal villi. A cascade-fermented supplement such as Regulat® – whose starting ingredients are whole foods (fruits, nuts and vegetables ) – holds a diversity of enzymes, di- and tri-pepides, etc. that are smaller and highly bio-available, even being able to be absorbed directly into the blood stream. For more information please review The Health Benefits of Cascade Fermented Foods by Karl-Heinz Blank M.D, Ekkehard Scheller, Johannes Aaron Seidler, Thomas Ganswindt, and Axel Kohler M.D. This entry was posted in Fermentation and tagged cascade fermentation, fermentation, history of fermentation on May 25, 2016 by Ashley. Regulat is a whole food concentrate made of the finest, selected organic ingredients. Unlike some products which are made from isolated active ingredients or certain specific nutrients that have been extracted, our products contain over 20 whole fruits, vegetables and nuts in a balanced form – full of nature’s intelligence™. In this blog we’d like to feature two specific ingredients, coconut and dates, which have experienced an increase of “mainstream” attention for their particularly notable nutritional value. Coconut meat is revered for its high nutritional value. 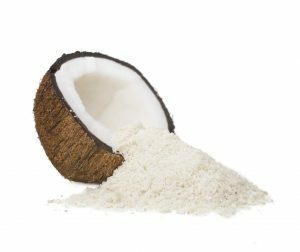 While most plants aren’t high in saturated fat, coconut is. The fat content is high in medium chain fatty acids, which help to lower bad cholesterol and increase good cholesterol levels. Coconut meat is rich in fiber, which is an important component of your daily diet to add your bulk to the stool which helps to move food through the digestive tract. Fiber also diminishes appetite as it makes you feel full, which aids in helping to make wiser decisions in your nutrition! Coconut is also high in the trace nutrient manganese, which aids in metabolization of both fat and protein, stabilizes blood sugar, and calms the immune and nervous systems. Coconut contains high amounts of potassium, which plays an important role in regulating proper fluid balance in the cells. Copper promotes healthy red blood cell production as well as aids in the sense of taste. Dates are a great source of carbohydrates. While carbohydrates seem to have a bad reputation, it’s important to remember they are an essential macronutrient that your body needs for energy. By making wise nutritional choices, such as with dates, to fill your nutritional needs, you’re helping to maximize your body’s functioning. Just as with coconut, dates are very high in potassium and fiber. 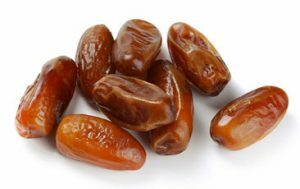 Dates are also packed with magnesium. Magnesium aids protein synthesis, blood glucose control and muscle and nerve function in your body, and it helps regulate blood pressure. Pregnant mothers, in particular, need an especially high amount of magnesium in their diet, so dates are an excellent addition to their daily diet. This entry was posted in Ingredients and tagged coconut, dates, digestion, ingredients, nutrition, superfoods on April 22, 2016 by Ashley. A recent clinical study done by Oregon State University examined the effect of the sulforaphane found in broccoli on breast tissue found in women diagnosed with breast cancer. Not only was the compound well tolerated by cells, but also it seems to slow down the growth rate of cancer cells, especially in early stages. Sulforaphane is a compound found in cruciferous vegetables, such as cauliflower, kale, cabbage, brussel sprouts, and other leafy vegetables. When broken down (e.g. through chewing), the enzymes that aid in the digestive process are said to release anti-cancer and antimicrobial properties into the body. The findings of this study are the first to directly suggest that diet plays a direct role in cancer management and prevention. 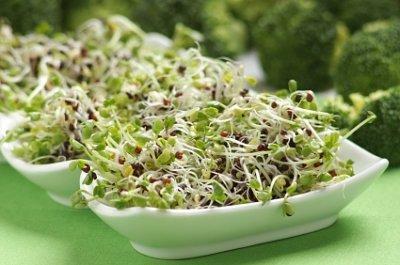 Their original goal was to “determine if sulforaphane supplements would be well tolerated and might alter some of the epigenetic mechanisms involved in cancer,” said Emily Ho, one of the professors involved in the study. However, the results of the study revealed much more. The link between diet and disease makes sense. Providing the body with quality food sources allows it to receive naturally occurring vitamins and nutrients that enables it to function efficiently. The human body requires thousands of enzymes each day that aid a broad spectrum of functions, from digestion, to hormone regulation, fat breakdown, detoxification, and more. It can be difficult to obtain this many enzymes from your diet each day, so supplementing properly will help the body regulate the nutrition you give it. Because of the cascade fermentation process, Regulat® is predigested, similar in bio-availability to the “food essence” produced by a perfectly functioning digestive system. It thus helps to balance and regulate many bodily systems and increases the body’s ability to manage the nutrients you’re giving it. This entry was posted in Balancing the Body's Systems and tagged diet and disease, Oregon State University, supplements and health benefits on February 12, 2016 by Ashley. Our Food is Losing its Muscle – Do Supplements Work? Supplements are used extensively by people aiming to get more balanced nutrients. As we know, there are many options on the market – vitamins, minerals or herbal products. As their name implies, these are to ‘supplement’ our daily food intake. The problem with many supplements is that they cannot be absorbed by the body. 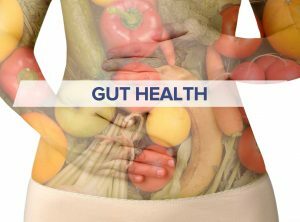 If the digestive system is weak or not working efficiently, the full value of these supplements may not be absorbed. Furthermore, if the body is already suffering from low enzyme levels – which is very common today – then even high supplement doses may not be effective as the body doesn’t have the enzymes to metabolize the supplements. Plus, vitamins and trace elements may be sold in a form that is not easily absorbed by the body. 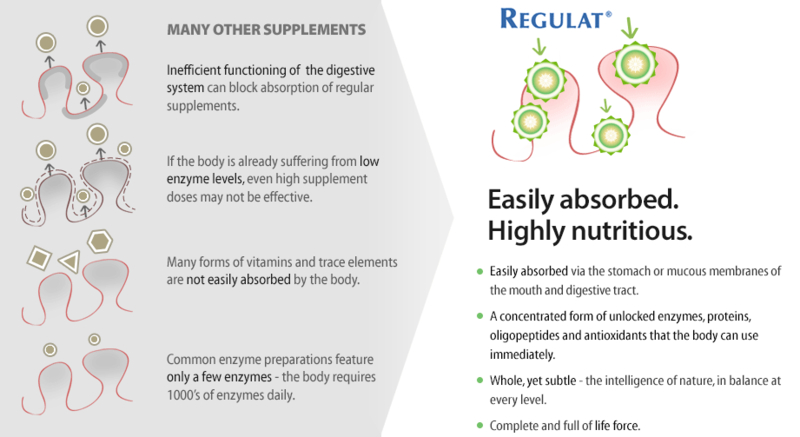 Enter Regulat – a concentrated, bioavailable form of unlocked enzymes, proteins, oligopeptides, and antioxidants that the body can use immediately. Regulat’s live cascade fermentation process is similar to the body’s own enzyme cascade process. 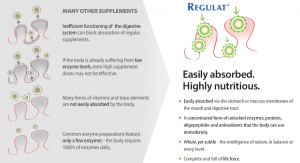 Regulat is a supplement that is a balanced, complete, liquid concentrate of valuable nutrients and ingredients, a concentrate full of ‘life force’. Most importantly, it is easily assimilated, and the body can begin using it immediately. Choosing to incorporate Regulat into your daily regimen thus helps create a balanced internal environment, allowing the body to perform its functions more efficiently and better absorb all that you consume. Many recognize the connection between supplements and health benefits; the key is to set up your body for success and help it to absorb those supplements! This entry was posted in Balancing the Body's Systems and tagged cascade fermentation, fermentation, Regulat, supplements and health benefits on January 29, 2016 by Ashley.